Fats are often discussed when planning a diet for losing weight. Fats and some other substances are the forms of lipids that are required by our body. People with the problem of dry skin are often referred with skin lotions that contain natural or synthetic lipids to keep the skin moist and soft. There are four main groups of organic molecules that are required by our body for functioning. Lipids are one of these four groups that are made of carbon, hydrogen, and oxygen elements. These three elements are also found in carbohydrates, but the number of hydrogen atoms in lipids is more than the oxygen atoms. Lipids are immiscible substances – means they can’t be dissolved in plain water (H2O). They are very crucial for us and helps in storage of energy that can be used later when there is an insufficient intake of carbohydrates. Lipids also take part in other function in our body, such as in cell membranes and hormones. There are various forms and types of lipids found in the human body. But all these lipids are categorized into four major groups, which are fats, phospholipids, steroids, and waxes. Let’s discuss the four types of lipids in more detail. Fat is one of the most known substances to common people which is a type of lipids. Many people consider fats as bad ingredients in the diet because it can increase the weight of a person. But, fats are one of the necessary components in the body to remain healthy. However, eating too much fat can cause problems, such as obesity and clogging of arteries. 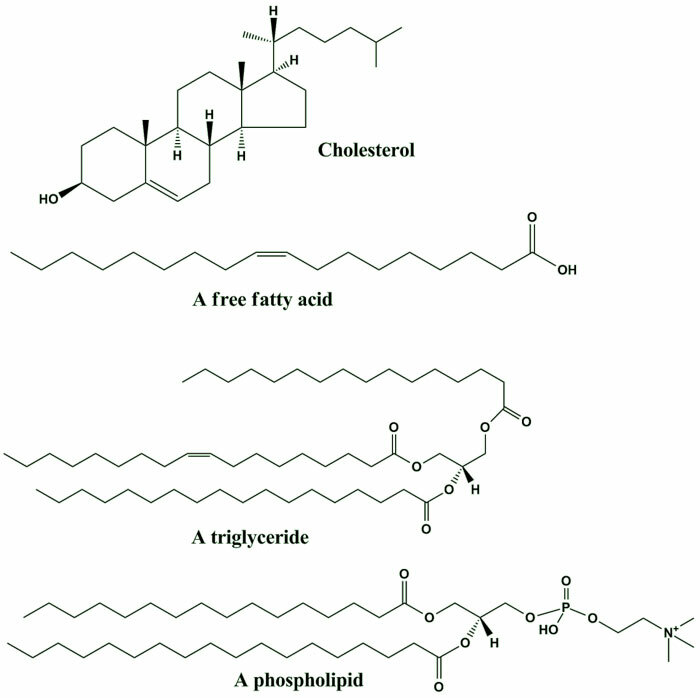 Fats are mostly made of fatty acids and glycerol, and contain three common elements like any lipid (e.g. carbon, hydrogen, and oxygen). Fats can be further divided into two types; saturated fats and unsaturated fats according to their chemical make-up. Saturated fats mostly remain in the solid state under normal room conditions, such as butter and cheese. These fats are not very good to eat in higher quantities because there are some risks associated with them (e.g. high cholesterol and clogging of blood arteries). Unsaturated fats, on the other hand, remain in the liquid state and are considered good for health. Phospholipids, also known as glycerophospholipids, are in many ways similar to fats but their chemical composition is different. These lipids help in metabolism and are used in the cell walls. Moreover, the neural tissues in our brain also contain phospholipids in large quantities. Steroids are the lipids which include hormones, chlorophylls in plants, and cholesterol found in our bodies and animals. Our body needs steroids, such as cortisol and cholesterol, to some level to function properly. However, too much cholesterol is bad for the health of the heart and arteries in our body. You may be familiar with the term wax because our ears contain plenty of wax for the protection against infections. Wax also helps to prevent the moisture from evaporation in animals and humans. It is a soft solid substance at normal room temperature but may become liquid at higher temperatures. Honey bees make their honeycombs from the wax, which also protects the comb from raining. Many vitamins need fats to be able to stay in our body and for absorption. Some of these vitamins are vitamin A, D, E, and K.
Fats don’t dissolve in water, but they float on the water if you mix them. If water is mixed with an alkali, such as dishwashing soap, it can dissolve the fats. Abdul Wahab, "Lipids," in Science4Fun, April 12, 2019, http://science4fun.info/lipids/.